The official signing ceremony was held on 26th September 2016 at Al Habtoor Motors Head Office and was attended by Mr Sultan Al Habtoor, President, Mr Jagdish Parulekar, CFO, Mr Joe Rogan Prestige Director and Mr Shibu Thomas , General Manager Fleet & Commercial Vehicles at Al Habtoor Motors along with Mr Paul Brannigan Middle East Manager for Wrightbus International. 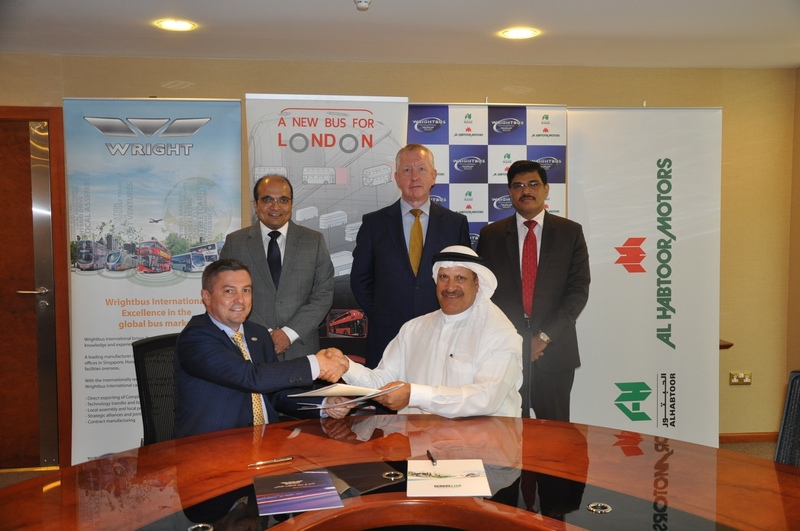 Under the new agreement, Al Habtoor Motors will become the official distributor for Wrightbus International’s products in the United Arab Emirates. Paul Brannigan, Wrightbus International Middle East Manager, who heads up the company’s office in Masdar City, Abu Dhabi, said: “We are both honoured and delighted to form this new relationship with Al Habtoor Motors and pleased to have them acting as our official distributor in the UAE. “We see a great synergy between the two family owned companies as Al Habtoor is highly respected in working with the most prestigious automotive marques in the region and has a close rapport with the people of the United Arab Emirates. We believe this heralds the start of a mutually successful and long term relationship for us and comes at a time when we are penetrating new market segments in the UAE.” Jagdish Parulekar, CFO for Al Habtoor Motors, said: “We are proud of our new association with Wrightbus, a truly innovative Bus manufacturer with a long history and global presence. Wrightbus has an excellent global reputation based around the quality, design and latest technology of its bus products. We are excited to be made their official distributor for the UAE and are looking forward to working with them to grow their market share in the region. Al Habtoor Motors have a very strong after sales division with best in class customer care to offer aftersales support for Wrightbus International clients in the region”. Established in 1946, Wrightbus is a leading manufacturer of Buses and is perhaps best known for its iconic New London Routemaster. Wrightbus International aims to bring product innovation, industry knowledge and experience of the Wright Group to a Global audience. Its range of Buses include Midi, Articulated, as well as Double Deck and as a trendsetter in vehicle design it leads the field in fuel efficient technology as well as low emissions. Wrightbus has multiple manufacturing plants across the world and a customer base which extends across the USA, Middle East, Asia and Australia. Al Habtoor Motors is the exclusive distributor of Mitsubishi, Fuso, Chery, JAC, Bentley, Bugatti and McLaren in the UAE and a part of the diversified multi-billion dirham business conglomerate Al Habtoor Group. Al Habtoor Group has varied interests and substantial investments ranging from Engineering, Real Estate, Hotels, Leasing, Education, Publication and Automobiles.